Qualitative research on self-management for people with Type 2 Diabetes Mellitus (T2DM) has typically reported one-off retrospective accounts of individuals’ strategies. The aim of this research was to identify the ways in which self-management strategies are perceived by people with T2DM as being either supportive or unsupportive over time, by using qualitative findings from both longitudinal intervention studies and usual care. 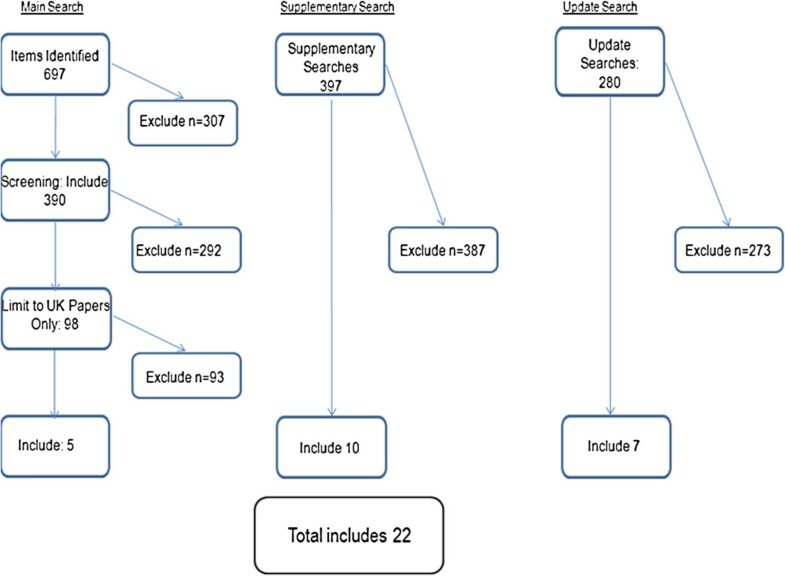 A systematic review of qualitative literature, published between 2000 and 2013, was conducted using a range of searching techniques. 1374 prospective qualitative papers describing patients’ experiences of self-management strategies for T2DM were identified and screened. Of the 98 papers describing qualitative research conducted in the UK, we identified 4 longitudinal studies (3 intervention studies, 1 study of usual care). Key concepts and themes were extracted, reviewed and synthesised using meta-ethnography techniques. By 2030, 500 million adults worldwide will have diabetes, with 2.5 million predicted in the UK . UK policymakers have described the burden associated with the progressive nature of diabetes in terms of direct costs to the NHS and associated healthcare support services; indirect costs to the economy due to loss of productivity; and the personal impact of diabetes, and complications for patients and their families . The National Service Framework for Diabetes called for a ‘skills-based approach [to] support self-care by improving knowledge, blood glucose control, weight and dietary management, physical activity and wellbeing’ (:16); and the associated NICE guideline for Type 2 Diabetes Mellitus (T2DM) recommends that people with diabetes should be offered structured education . However, a review of service organisation and delivery in the UK identified a lack of health services research in diabetes; variability in the quality and range of support that is provided to people with diabetes; and a recognition that supporting self-care behaviours is challenging for many groups of patients with diabetes . Randomised controlled trials of educational interventions, specifically for T2DM in the UK, have proved inconclusive. A trial of an expert patient education intervention found that it improved glycaemic control, reduced total cholesterol level, body weight, BMI and waist circumference, reduced requirement for diabetes medication, increased consumption of fruit and vegetables, enjoyment of food, knowledge of diabetes, self-empowerment, self-management skills and treatment satisfaction; but there was no overall improvement in quality of life at fourteen months . A trial of diabetes education and self-management for ongoing and newly diagnosed (DESMOND) programme found that while those in the intervention group reported positive improvements in beliefs about their illness, there was no difference in HbA1c or dimensions of quality of life at twelve months . Furthermore, a recent systematic review established that tailored interventions for T2DM, hypertension and heart disease had no impact on medication adherence, self-monitoring, exercise, smoking or diet control, while having a modest impact on screening, dietary fat intake and levels of physical exercise . An observational study found that people with T2DM rationalise their understanding and response to diabetes by externalising control of their condition to health care professionals who are responsible for their care ; while a qualitative study with participants from the DESMOND trial identified that individual orientations (degrees of acceptance or resistance to either their new ‘diabetic’ identity or any perceived consequences of that identity, and perceptions of the required degree of personal responsibility) may mediate both education preference (e.g. group education that is peer or professional led) and ultimately self-management . While both provide useful insights, they only collected retrospective accounts via one-off interviews . Given the long term, chronic nature of T2DM this may not capture aspects of change or development in attitudes and behaviours over time. Existing syntheses of qualitative research (including only non-intervention studies) indicate that patients with T2DM often prioritise the maintenance of their current quality of life over future improvements to their biomarkers. Paterson et al. demonstrated that people learn to balance their diabetes by combining experience with experimenting with strategies for managing their illness ; while Campbell et al. identified that balance required a complex process of understanding and ‘an ability to manipulate dietary and medication regimens in order to live life as fully as possible, rather than limiting social and work activities in order to adhere rigidly to medical advice’ (:681). More recently, Gommersall et al. have established the salience of culture and gender roles, as well as perceptions of threats to selfhood . However, we are not aware of any syntheses that have explicitly compared observational and intervention-linked longitudinal qualitative studies of diabetes self-management. Such a synthesis could illuminate the long term sequelae of diabetes self-management strategies, and prove crucial for understanding the impact of the progressive and degenerative nature of diabetes [15, 16]. The aim of this qualitative synthesis was to identify the ways in which self-management strategies are perceived by people with T2DM as being either supportive or unsupportive, from prospective qualitative research using data collected on two or more occasions over a twelve month period, and to compare experiences of those taking part in intervention studies and those receiving usual care. Systematic reviews use a structured approach to identify, appraise and synthesise research . Here the meta-ethnographic method described by Noblit and Hare was used to conduct this qualitative synthesis . Meta-ethnography is an interpretive rather than an aggregative approach, which involves the translation of individual qualitative studies into each other, through the re-interpretation and transformation of their theoretical and substantive concepts [13, 16, 19]. We adhered to the enhancing transparency in reporting the synthesis of qualitative research (ENTREQ) statement . Experts in the field were contacted for published and unpublished papers. References, including titles and abstracts, were then loaded into Endnote X5 , and the search was updated in May 2013. Used follow–up qualitative data collection of at least 12 months. We appraised the quality of the included papers using a validated appraisal tool  as a means to assess the rigour and validity of the data collection and analysis techniques employed by the research authors (Table 1), which informed our analysis of the data . Purposive sample: 30 patients with newly diagnosed T2DM participating in an RCT. Sampled to represent trial arm, recruitment site, and gender. Convenience sample: 40 patients with newly diagnosed T2DM. Semi structured face-to-face interviews at12 months (n = 25) ,and 24 months (n = 11).9 matched consultation sessions and telephone interviews at 36 months. Semi structured face-to face interviews and fieldnotes at 0, 6, and 12 months (n = 40) and 48 months (n = 20). Constant comparison. Source, method and theoretical triangulation. Constant comparison. Thematic analysis. Construction of extended case reports over time. Primary care, deprived area in North West England. 89 patients, randomised control wait list design Group A were randomly allocated to the treatment initially (n = 30), whilst the Group B acted as the short-term control group (n = 23) These two groups were then combined to form the short term trial group. 591 patients randomly allocated in a1:2 ratio. Control n = 197, Call-centre treatment support n = 394. N/A. 40 patients with T2DM. Explorations of variance, location of care (12.5% primary care, 87.5% secondary care), diet, medication, class and gender. Group C received the intervention at the end of the trial period (n = 36). Patients randomized to ‘usual care’ received standard advice about diet from trial dieticians at their baseline visit, and were seen by a doctor blinded to treatment at baseline, six and twelve months . Patients randomized to the ‘usual care’ group continued with conventional treatment based on local guidelines, which had been in place for over ten years, supported by a continuing education program among all primary care practices . 8 week educational programme including: physical activity, exercise, relaxation and health topics. At 6 months, intervention associated with benefits in HbA1c levels (−0.1%), illness attitudes, and perceived treatment effectiveness, compared to controls. At 12 months, only illness attitudes and self-monitoring showed benefit . At 12 months, compared with the control group, HbA1c improved by 0.31% in the intervention group, and the improvement was significantly greater for those with a baseline HbA1c > 7% . At 12 months, the control group saw an improvement in their understanding, expectation of disease continuation, and concern of their illness; while the intervention groups increased their understanding, became less concerned, felt more in control of their illness, were more satisfied with their diabetes treatment, and had higher self-reported health scores . At 36 months, there was a statistically significant reduction of HbA1c by 0.24% attributable to the intervention . The research team repeatedly read the studies to identify key themes and concepts, and to identify areas of consonance and dissonance between the included studies. JF produced a structured summary for each paper, and with input from RG and NB, tabulated the key results, concepts and themes for each study, so that they could be compared and contrasted. Quotations from patients and carers (first order data), as well as author interpretations of the data (second order interpretations) were interpreted and integrated by the research team (into third order concepts) to produce a ‘line of argument’ [13, 18, 19]. The purpose of meta-ethnography is to identify where similar concepts and themes from different studies or papers refer to the same entity (congruent synthesis) or to opposing findings (refutational synthesis); this is referred to as the papers’ findings being ‘translated’ into each other [18, 46, 47]. Thus, as interpretations emerged, they were subject to systematic testing within and between the studies, and in consultation with a wider stakeholder group. This group included People with Type 1 or Type 2 Diabetes, members of the South West Peninsula Diabetes Research Network, Diabetologists, General Practitioners (with and without a special interest in diabetes), the Director of Public Health, and community or hospital based Diabetes Specialist Nurses. The searches resulted in 1374 abstracts (Figure 1). Preliminary screening identified that 98 of these papers described qualitative research conducted in the UK. A full text screen identified only four studies (reported in 15 papers) that used longitudinal data methods over 12 months or more. An updated search in May 2013 identified 280 further abstracts of which seven conference abstracts about the four studies were identified. Similar to a meta-ethnography of patients’ experience of managing anti-depressants we identified two groups of papers early in the synthesis process and grouped them along a timeline . Reflecting the growing use of longitudinal qualitative methods in medical research more generally, the first group concerned serial qualitative studies that were nested within randomized controlled trials of interventions in order to elucidate causal pathways, while the second were stand-alone studies exploring the influence of health services on the conceptualization of illness over time . Six papers concerned three studies where qualitative methods were nested in trials of self-management interventions. The DALY study employed focus groups to explore the impact of an eight week educational programme administered to all trial participants (n = 89) via five trial courses running over a period of one year [25, 26]. The Early ACTID study purposively sampled participants from both trial arms and various recruitment sites to elicit patient perspectives of a trial of diet versus diet and exercise versus usual care via face to face and telephone interviews . The PACCTS study purposively sampled participants from a deprived urban area, and allocated them to four study groups (where HbA1c control was deemed to be ‘good’, ‘bad’, ‘improving’ or ‘deteriorating’), in order to determine the utility of a tele-care support intervention that was titrated to HbA1c results [31–33]. Although the qualitative data collection in the paper by Malpass et al. was only over a period of nine months , its findings were substantiated by data in an associated quantitative paper that extended over twelve months . Nine papers were about a single sample of patients, recruited from both primary and secondary care within six months of diagnosis with Type 2 Diabetes, and concerning their perceptions of self-management in the context of changes to diabetes service delivery in Scotland. Four papers utilised interviews at baseline six months and 12 months [38–41]; and five papers providing additional data collected at 48 months [11, 42–45] (Table 2). This set of papers provided a rich data set, which variously employed grounded theory, thematic analysis and longitudinal data analysis techniques to interrogate the sixty interviews, in terms of the patients’ perspectives of service delivery  as well as discrete concepts such as control and causality [42, 43]. Perspective influenced the study design? Is the context adequately described? Sample adequate to explore range of subjects/ settings? Sample drawn from appropriate population? Claims to generalisability follow from data? Key: Y=Yes, N= No, CNT = Cannot tell. The inclusion of these papers allowed the reviewers to explore any potential influence of either trial design (e.g. a supportive trial environment may enhance the positive impact of the interventions) or study duration (e.g. ongoing information and support, which are central to the underpinning philosophies of the intervention studies, and foster understanding and confidence, and ultimately an enduring self-efficacy). Combining studies with diversity of purpose provides opportunities for comparisons and potentially more fruitful and meaningful insights, than that which may be obtained by synthesising papers that are more obviously methodologically or substantively ‘similar’ . Using the established synthesis techniques outlined above, the reviewers identified and translated the key concepts in each of the papers (e.g. the individual study authors’ second order interpretations of the ‘raw’ or ‘first order’ patients’ words) into three interlocking third order constructs (Table 3, first column): Patient as stakeholder (a patient actively engaged with their service provision), Timeliness of support (the appropriate provision of provision and support, often repeatedly, tailored to the current needs and preferences of the patient, and their subjective understanding of their condition), and Empowerment (the willingness and ability of people with diabetes to self-manage in order to achieve purposive and meaningful behaviour change strategies); and from these produced a line of argument about the support needs of people with T2DM (Table 3). Subsequent columns in Table 3 summarise the second order concepts, and the narrative ‘translation’ of those concepts, and details of the papers from which they were drawn, which were listed and tabulated so that they could be explored, compared and juxtaposed.We conceive of these three aspects as interlinked and supporting each other, and there is some overlap, but they represent the cornerstones of good support that allow people with T2DM to successfully manage their condition. These aspects can be mutually supporting, leading to a virtuous circle and improved self-management, while their absence may lead to a vicious circle for patients as they become increasingly disempowered, unable to participate in their own self- care and unable to access the support they need to change (Figure 2). Patients respond better to advice that is tailored to their needs –but staff do not always do this. Patients feel ownership when their views and experiences are valued - but staff attitudes can undermine this. Patients benefit from having gaps in their knowledge addressed at their own pace (e.g. if they can ask fundamental questions beyond the initial assessment) – without these opportunities lay interpretations develop. Patients value having information and support that matches their current perspective (e.g. if/when they are ready to understand their responsibility) – otherwise patients can disengage with service provision and/or self-management. With understanding, some patients are able to develop a flexible regimen (e.g. titrate exercise to treats and cheats) – but without ongoing support some do not develop appropriate causal models. Flexible regimens can enhance both control of blood glucose and quality of life – but without tailored/ ongoing education that goes beyond ‘learning by rote’ many patients find this difficult to achieve. By comparing and synthesising the key concepts in the intervention and usual care studies, a third order concept was developed about the notion of patient as a stakeholder: a patient actively engaged with their service provision. Participants in the intervention studies were strategically encouraged to ‘own’ and actively manage their diabetes, while those in receipt of usual care did not have the advantage of benefiting from the intervention, nor of staff with additional expertise. In its absence they provided their own interpretation of both their condition and their role in its management. Within the trial of an educational support intervention (PACCTS) self-management was fostered by tele-carers tailoring information to individuals’ needs . An example is provided of a woman who had had a stroke, where information was provided to her husband to optimise ‘portion control’ [Participant quote, : 183] at mealtimes, as exercise was not a viable weight-reduction strategy. This advice was subsequently reinforced by the tele-carer acknowledging that weight loss is difficult (using ‘empathy’) and encouragement to the couple to maintain their efforts (‘positive reinforcement’) [Author quotes, : 183]. Participants suggested that having nurse tutors who showed ‘integrity, respect and compassion toward them, as well as demonstrating their nursing expertise in diabetes’ fostered a ‘process of moral interaction’ [Author quotes, : 200]. This facilitated patient participation in both their education, and development of the skills for effective self-management, while nurturing reciprocal health care relationships which are fundamental to ‘quality of life for people with chronic illness’ [Author quote, : 200]. ‘fifteen nurse or dietician visits of twenty minutes each over a twelve month period …seeing the same nurse or dietician throughout the trial.’ [Author quote, : 259]. A review of the baseline medical histories taken in EarlyACTID identified that, in contrast to NICE guidelines, many patients were not given the opportunity to make any lifestyle changes before commencing on oral hypoglycaemic agents within one month of diagnosis . As such, those in the intervention arms of the trial (receiving intensive diet, or diet and exercise support), were afforded the first opportunity to set dietary goals, such as moderating fat intake or increasing the amount of fruit and vegetables that they ate . This led Malpass et al. to conclude that the first year post-diagnosis is a ‘crucial period of time’ where patients can be supported to modify their lifestyles in ways that are necessary to develop a sense of control ‘over time’  (Italics added). This is reflected in the levels of support described by some of the participants in the usual care study who, without adequate support and information, developed their own interpretation of the relationship between their experience of diabetes symptoms and service provision over time. Similar interpretations were made when participants were prescribed equipment (e.g. blood glucose meters or urine testing sticks) and, in addition, some of those conducting urine testing perceived a negative test result as indicative of an absence of diabetes, which could impede subsequent self- management . The intervention studies provided a supportive environment in which participants could understand and develop techniques for monitoring and managing their condition which fitted in with their lives, and which they could subsequently try out in the real world setting and discuss with trial staff. In contrast, participants receiving usual care often lacked insight into their condition, which ameliorated both the understanding and confidence required to effectively self-manage, and led to many disengaging with care providers on all but a superficial level. We developed a third order concept around the notion of timeliness of support: the provision of appropriate support and information, often repeatedly, tailored to the current needs and preferences of the patient, and their subjective understanding of the progression of their condition. Without such timely support, patients are unable neither to be stakeholders in decision making nor to be empowered to make changes. While those in the intervention studies received frequent opportunities for re-engagement with professionals and reinforcement of diabetes knowledge, those in the usual care study were left largely to fend for themselves. Participants receiving the educational intervention (DALY) identified the course as providing optimal conditions for ‘pressurising’ them to take more notice of their health adding that ‘the protected time for learning is very important’ [Participant quotes, ]. They emphasised the significance of ‘real life’ and the need for practitioners to acknowledge that compromise was required for them to conform to treatment regimens [Participant quote, ]. The study authors conclude that timely education can lead people to re-evaluate their perception of diabetes as a ‘mild’ disease, and that this change can allow them to view diabetes as ‘integral’ to themselves, and therefore less of a ‘threat’ to manage [Author quote, ]. Quantitative findings suggest that the DALY intervention produced sustained improvement in both illness attitudes and self-monitoring at 12 months, with the researchers concluding that continued reinforcement may be required to sustain behaviour change and notions of self-involvement . ‘Because I am conscious of the fact that I have to give those figures to somebody and it has been explained to me although I do not dwell on it, the implications if I do not control my levels the fact is I am susceptible to strokes, etc. The underlying factors of diabetes, I do not like to think about it but I have been made aware through calls and general conversation… I really, really love chocolate. I could eat four bars in the morning, and I am not saying I do not touch it but, I am more conscious of the damage.’ [Respondent quote, : 224]. Both of these quotes emphasise that agency is facilitated by regular, repeated and timely contact . EarlyACTID participants also identified that confronting the reality of their diagnosis was a motivator for change: ‘I’m in control because fear made me control my diabetes’, and ‘I don’t want to end up on insulin . . . if I can maintain this level of health I will be happy . . . I want to avoid even going on tablets’ [Participant quotes, : 260]. However, a small number countered that making multiple lifestyle changes could be difficult, with two men concluding that increasing the amount of exercise, while reducing portion sizes, was counterproductive; while a female participant struggled to make changes without the support of staff or family . This emphasises that change needs to be at a pace that is suitable for an individual, and taking into social roles, in order to achieve sustained behaviour change. Eric: Erm I think I know enough erm but erm I don’t feel that y’know at the moment I-I don’t need, er,don’t want others to talk to me about diabetes. I think that might suggest that I’m becoming obsessional about the damned thing and I-I don’t know if I want … if you’re sort of searching out people or organisations that are talking about diabetes all the time, you sort of become a diabetic person and erm well you’re somebody else then. Jennifer: No, I read quite a bit about it y’know on the leaflets and that. And sometimes I often think there’s a book that they advertise in all the newspapers and I think “I’m going to send away for that” but sometimes I think you can know too much. So I’ve never done it. Furthermore, most patients considered that their need for prompt information and reassurance would attenuate over time , which suggests that, in the absence of appropriate information, some people are unable to appreciate the chronic nature of their diabetes and anticipate their future needs. Likewise, in relation to medicine taking, ‘few respondents claimed to be fully adherent, highlighting forgetfulness as the central reason for this’ [Author quote, : 493]. Forgetfulness was common for asymptomatic patients where diabetes was not ‘at the forefront of your mind’, for those with busy lives who forgot to take their medication with them, and those with multiple co-morbidities who stressed that, ‘if you take a lot of tablets, you’ve no idea when you’ve taken them, and what you’ve taken’ [Participant quotes, : 493]. The intervention studies provided structured opportunities for participants to ask questions and to be provided with timely and appropriate information. In contrast, participants in the usual care study describe a cascade of missed opportunities. The final third order concept was developed around empowerment: the willingness and ability of people with diabetes to self-manage in order to achieve purposive and meaningful behavior change strategies. Participants in the intervention studies were often able to claim empowerment as a consequence of the support and information that they received, although not all patients were willing or able to self-manage. The study of usual care illustrated that when patients are in receipt of standard healthcare, diabetes related ‘quality of life’ may also be mediated by one’s orientation or perspective. ‘I’ve learnt about other people’s ideas, other people’s problems and you find that you are not on your own. You can learn how they are overcoming the problems.’ [Participant quotes, : 202]. ‘I am able to bend more now. I no longer find it [diabetes] a nuisance.’ [Participant quotes, : 202]. Thus physical activity could be viewed as both a motivator for, and integral to, diabetes self-management. At twelve months, PACCT participants with a baseline HbA1c greater than 7% achieved significant improvement in glycaemic control  and high levels of satisfaction ; while follow-up at three years identified a continuing significant reduction of HbA1c attributed to the intervention, without additional pharmacological means in a sample drawn from a socio-economically deprived urban community . Despite the PACCTS intervention being well received by both participants and health care providers, a subsequent economic evaluation of PACCTs found it to be borderline cost effective . Furthermore, Cooper et al. conclude that the ‘low uptake of patient education may not just reflect a cultural climate that promotes dependency’, which they attribute to a bureaucratic health care system in the UK and health professionals who lack specialist knowledge, ‘it may also reflect patients’ desires to continue with their passive role’ [: 204–5]. In contrast to notions of a ‘passive’ patient, the study of usual care unpacked the dynamic relationships between patient perspectives and behaviour, in the absence behaviour change interventions. By exploring changes in causal accounts over four years, Lawton et al. contend that treatment experiences mediate respondents’ disease perceptions . Whereas ‘Ellen’ maintained her causal account of her diabetes being due to her poor diet over time, ‘Fiona’ amended her account from having a dietary cause to being hereditary, on the assumption that ‘even my son’s got it now… it must be hereditary’ [Participant quote, : 51]. In contrast ‘Graham’ begins with a hereditary account of his diabetes, and later acknowledges that he ‘made a pig of myself and put on a lot of weight’ [Participant quote, : 51]. Thus, Lawton et al. suggest that ‘causation accounts may be informed by, and revised in light of, the perceived efficacy of treatments’ [Author quote, : 51]. ‘By his third interview, Callum had “compared notes” with work colleague with T2DM who had recently moved on to insulin, and “seemed to control things a lot better”. By virtue of being able to titrate her insulin doses, this colleague appeared to have the freedom to eat and drink what she wanted, a freedom which Callum professed to desire. At this point, Callum stopped talking about being able to control his own diabetes with tablets and diet, suggesting that “sooner or later, it’s going to become an insulin issue”. He also ceased to blame any “spikes” recorded through SMBG on his continued snacking. Instead, he attributed them to “the tablets no longer working”, and used this to justify bringing forward his appointment with his consultant and negotiating a move to insulin: “I eventually convinced them I was ready for it”’ [Author quote, : 53]. By re-framing his orientation, this participant is able to legitimise his transition to commencing insulin as a strategic form of self-management that will improve his quality of life. Participants in the usual care study were able to develop causal accounts that could inhibit their sense of agency and legitimise their inability to self-manage. Furthermore, the development of lay causal narratives and the negation of a ‘diabetic identity’ (resulting from lack of timely information and support) enabled some respondents to absolve themselves of any responsibility for their diabetes and inhibit subsequent behaviour change. In contrast, with the support and information integral to intervention studies, trial participants were better able to achieve empowerment. This enabled participants to develop flexible diabetes management strategies that facilitate (rather than inhibit) quality of life and long term medical outcomes (including blood glucose and weight control. 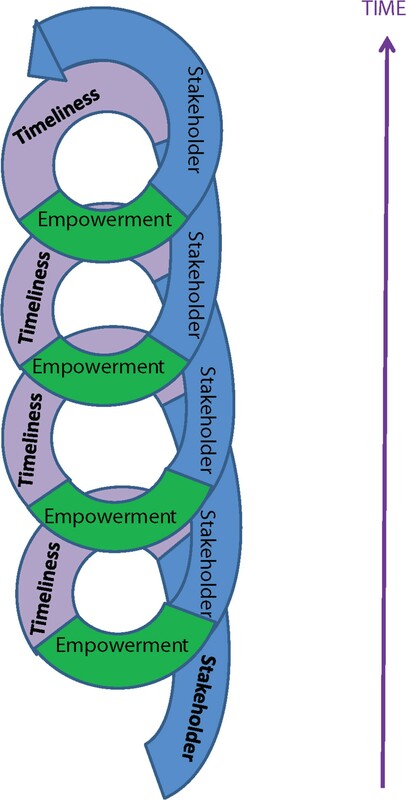 Having identified three interlocking third order constructs (Patient as stakeholder, Timeliness of support, and Empowerment, that can be positively or negatively reinforcing), the synthesis substantiated a line of argument that stated that for self-management strategies to be effective, people with diabetes require a sense of ownership of the management of their disease. This can be fostered through the timely provision of information and advice that acknowledges and accounts for their individual circumstances (e.g. disease duration, and prior experience of diabetes management). Noblit and Hare contend that the objective of an interpretive synthesis is either to make the obvious obvious, make the obvious dubious, or make the hidden obvious . While it has long been recognised that patients with chronic illness require enduring support to effectively self-manage their condition , this longitudinal qualitative synthesis has demonstrated that this is still not routine practice, and that this omission may have a cumulative deficit for people with T2DM. These findings suggest that, in the absence of timely support and advice, the construction of elaborate lay models over time may have a self-protective effect, which can mitigate a sense of failure and liability. It is incredibly difficult for someone with an enduring and unchallenged hidden causal account that minimises behavioral causes of T2DM and/or the validity of self-management, to become a confident and flexible self-manager, as this requires an acknowledgement of one’s accountability. Building upon existing retrospective cross-sectional accounts, the usual care study claims that if people do not acquire a stake in their diabetes management shortly after diagnosis, or they lose that stake due to lack of support, this can have an immediate impact upon how they frame ‘their diabetes’ which may subsequently negate their ability to make informed decisions and choices [9, 10]. While the on-going information and support, which are central to the underpinning philosophies of the intervention studies, foster understanding and confidence and ultimately self-efficacy, the findings of the study of usual care identify that unsupported self-management can lead to people with diabetes not fully engaging with resources and behaviours, the result of which may be detrimental to their quality of life. Additionally, while the usual care study identified that the empowerment required for the effective management of quality of life and biomarkers can be mediated by a person’s orientation or perspective, even resource intensive interventions cannot guarantee that participants will willingly embrace self-management. By extending the time-frame of papers included in this synthesis (e.g. those with repeat data collection over twelve months, rather than one off interview studies), we are able to build upon the findings of existing syntheses. The ability to achieve balance [12, 13] may be mediated by cycles of behavior change, such that with adequate support a positive feedback mechanism can develop in relation to diet and exercise which may facilitate both quality of life and control of biomarkers, while unsupported self-management can inhibit the effective management of Hba1c, as the perceived burden on one’s quality of life may be too great. These findings suggest that people with diabetes both value and profit from ongoing support and information, from both health professionals and peers [53, 54], when it is reciprocal and tailored to their own needs. The challenge is to deliver continuity of individualised care in the context of current changes to the healthcare system in the UK and elsewhere. The emphasis should be on small patient-centered goals, such as weight-loss or portion control, that are achievable, rather than the prioritisation of biomarkers, which some people may perceive as unachievable and burdensome. Not all people with diabetes have the propensity or ability to self-manage, and following Noblit and Hare’s assertion that the purpose of comparative translation is ‘not to achieve closure, but to enable discourse’ , greater understanding is now required of how health professionals may both inhibit and facilitate self-management in specific populations (such as the elderly or those with multiple co-morbidities) who may have additional needs that interact with any diabetes specific information and support. There is now a need to facilitate on-going open dialogue in usual practice, in order to achieve sustainable change in diabetes self-management. This paper has demonstrated that it is possible to synthesise longitudinal qualitative papers in order to identify strategies for the long term management of T2DM. Although data from only four patient samples were synthesised, this rich a dataset represents over one hundred interviews and ten focus groups, collected over a four year period. This is in keeping with the amount of data synthesised in previous meta-ethnographies . Combining qualitative papers associated with different objectives and methodological approaches is not without challenge [48, 50]. The impact of the ideological and theoretical perspectives inherent in the study of usual care, and their impact on data collection and analysis were not always clear, and we were unable to assess the sustainability of change that could be attributed to educational interventions beyond three years. The authors of the intervention studies identified that the supportive trial environment may have enhanced the positive impact of the interventions , We contend that the comparison between the two types of studies illuminated the information and support that were missing from usual care, and which are necessary for people with diabetes to successfully self-manage. The supportive trial environments allowed patients to test out and discuss new monitoring and management strategies. Both sets of papers suggest that this does not routinely happen in ‘usual care’. Patients describe an inability to articulate or willingness to discuss their concerns early on in the disease trajectory, with few, if any, subsequent opportunities to subsequently ask key questions. This negation may lead to some people never fully grasping the nature, severity, or progressive nature of their condition, or which monitoring and management practices are most appropriate. All four studies acknowledge that the qualitative study samples may have been self-selected . Furthermore, most of the participants in the studies were white British; although we anticipate that research currently being conducted by Greenhalgh et al. could further illuminate the mediating roles of migration and culture . However, we were able to develop a line of argument that for self-management strategies to be sustainable beyond the duration of clinical trials, patients require timely information and support, a sense of having a role in their management that is appropriate for their beliefs and perceptions, and an overall sense of empowerment in managing their diabetes in relation to other aspects of their life. We thank all of the patients, clinicians and commissioners who participated in the advisory group and stakeholder workshops, as part of this research. This is a summary of independent research funded by the National Institute for Health Research (NIHR)’s Research for Patient Benefit programme (Grant Reference Number PB-PG-0909-19257). NB and RG are partially supported by the NIHR Collaboration for Leadership in Applied Health Research and Care (CLAHRC) for the South West Peninsula. The views expressed in this publication are those of the author(s) and not necessarily those of the NHS, the NIHR or the Department of Health in England. RG is partially funded by The European Centre for Environment and Human Health, which is supported by investment from the European Regional Development Fund and the European Social Fund Convergence Programme for Cornwall and the Isles of Scilly. JF carried out preliminary screening and data extraction and drafted the manuscript. CC conceived the search strategy and undertook the searches. RG participated in the design of the study and undertook second screening and data extraction coordination and helped to draft the manuscript. NB conceived the study, and participated in its design and coordination and helped to draft the manuscript. JF, RG and NB conducted the data analysis and synthesis. All authors read and approved the final manuscript. McMaster University Search Filters for MEDLINE in Ovid Syntax and the PubMed translation. http://hiru.mcmaster.ca/hiru/HIRU_Hedges_MEDLINE_Strategies.aspx#Qualitative. Thomson Reuters (2013) Endnote 5. http://thomsonreuters.com/.